All the flavors of a classic Margherita pizza in cheesy pasta form! 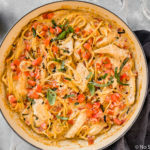 This One Pot Chicken Margherita Pasta with Ricotta is loaded with tender chicken, ripe tomatoes, garlic, basil and Italian seasonings in a creamy-dreamy ricotta parmesan sauce! It’s easy to make and even easier to devour! You can absolutely substitute boneless, skinless chicken thighs for the breasts if desired. Just be sure to adjust (increase) the cooking time in step one by a couple minutes. 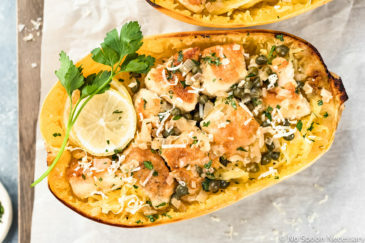 I highly recommend using fresh grated parmesan for this (and any) recipe. 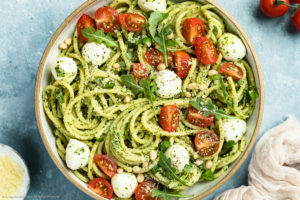 That stuff in a green can not only tastes weird, but it also does not seamlessly melt into the pasta and become silky smooth like fresh grated parmesan does. Just make sure you use the smallest holes on your box grater for this. 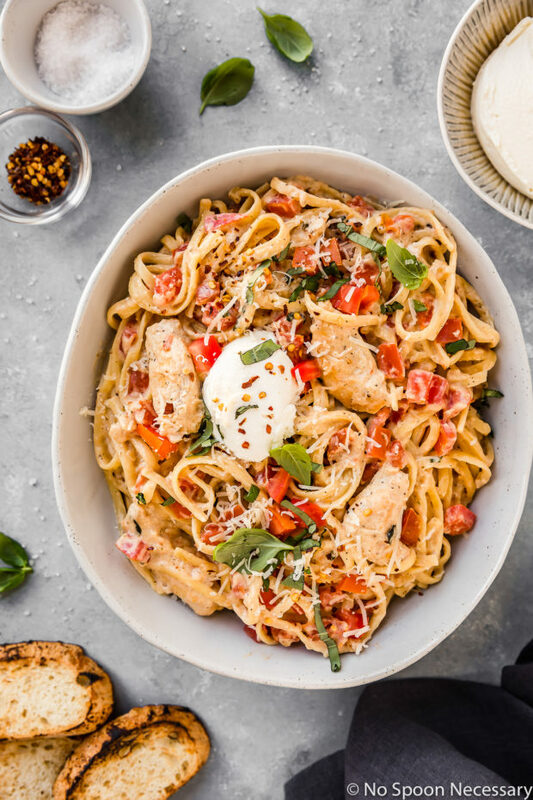 I strongly recommend you continue to season this One Pot Chicken Margherita Pasta with Ricotta with salt and pepper as you go. (i.e. season the chicken, then season the onion, the half-and-half mixture, etc.) Pasta with creamy based sauces require a good amount of salt to really make all the flavors sing. 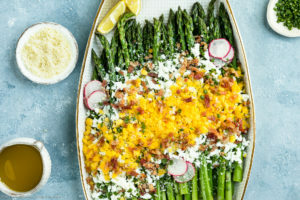 The sauce will continue thicken after you stir in the parmesan, and after you add in the ricotta it will become incredibly rich and creamy, so do not be alarmed if it seems a little bit thin as you are cooking it. I always encourage you to make a recipe your own. 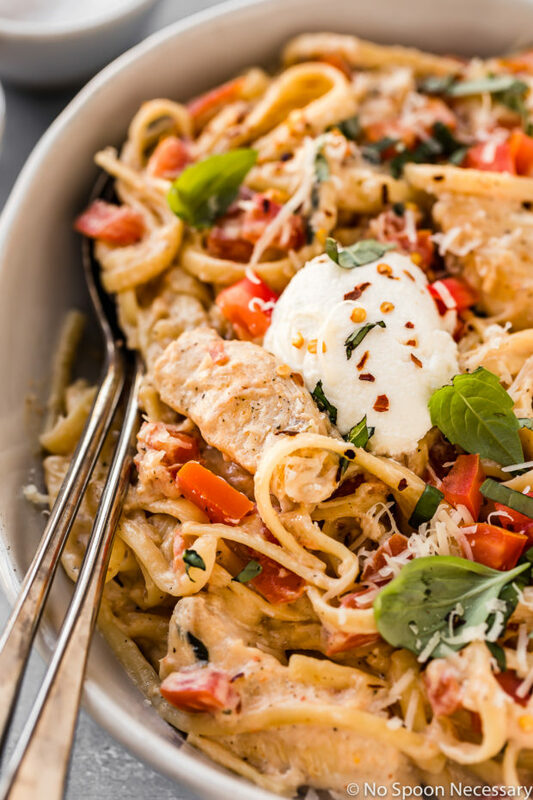 If you prefer fettuccine to linguine, use that! If you like your pasta with a lot of heat, use more crushed red pepper flakes. If you like a ton of fresh basil, increase the basil to 1/3 or 1/2 of a cup. Just do you! Why choose between pizza and pasta when you can have both!? 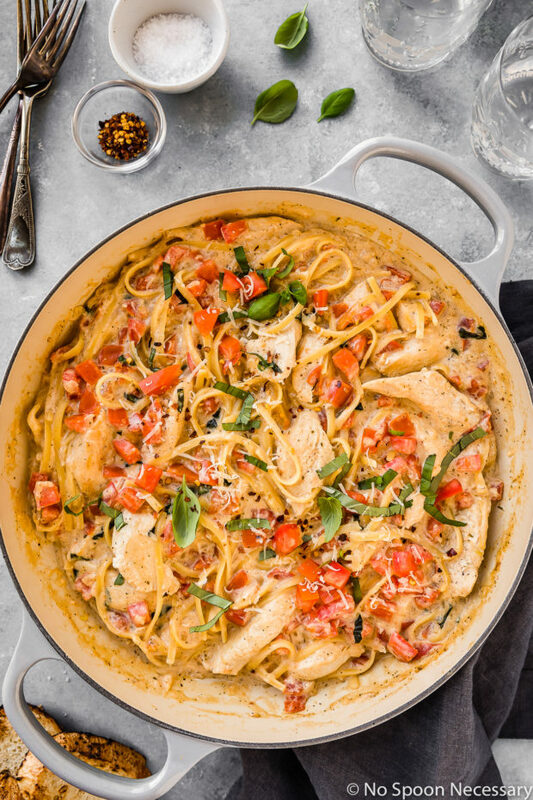 Creamy-dreamy, full of fresh flavor and easy to prepare, this One Pot Chicken Margherita Pasta with Ricotta is sure to become a family favorite! Until next week friends, cheers – to one pot wonders! All the flavors of a classic Margherita pizza in cheesy pasta form! 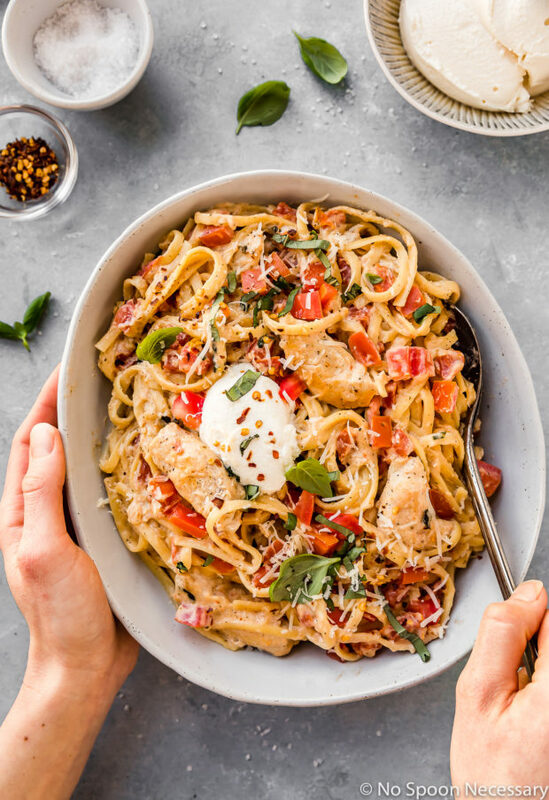 This One Pot Chicken Margherita Pasta with Ricotta is loaded with ripe tomatoes, garlic, basil and Italian seasonings in a creamy-dreamy ricotta parmesan sauce! 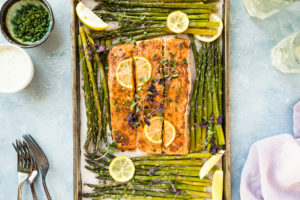 It's easy to make and even easier to devour! Melt 1 tablespoon of butter in a large straight sided skillet, or Dutch oven, over medium high heat. Add the chicken and season generously with salt and pepper. Cook until golden brown, but not cooked through, about 4-6 minutes total. Remove chicken to a plate. Reduce heat to medium low and add in the oil and remaining butter. Once melted, increase heat to medium and add in the onions and season with salt and pepper. Sauté for 4 minutes, stirring occasionally. Add in and continue to cook for 1 minute. Add in the garlic, Italian seasonings and crushed red pepper flakes. Cook until fragrant, about 30 seconds. Add in the flour and cook, stirring, for another 1-2 minutes. Add in the chicken broth and half-and-half, whisking constantly to combine. Add the chicken back to the pan along with the pasta. Bring to a slow boil, stirring occasionally, then immediately reduce to a simmer. Cover and cook for 10-15 minutes, or until the pasta is just al dente. Reduce heat to low and stir in the parmesan cheese until melted. Stir in the remaining tomatoes. Taste and adjust for seasoning with salt and pepper. Garnish with fresh basil, dollop on the ricotta and sprinkle with red pepper flakes. Serve and Enjoy! 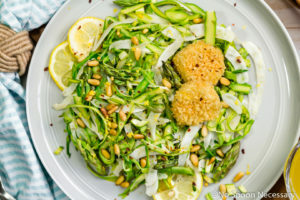 I strongly recommend you continue to season this dish with salt and pepper as you go. (i.e. season the chicken, then season the onion, the half-and-half mixture, etc.) Pasta with creamy based sauces require a good amount of salt to really make all the flavors sing. 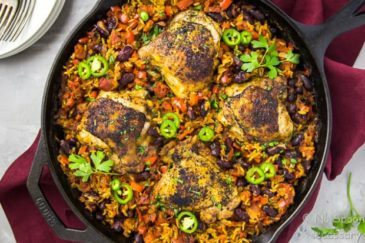 I love one pot dinners, Cheyanne – so easy and good. 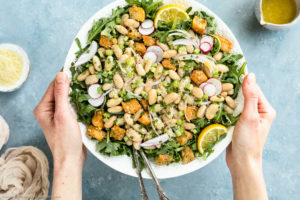 And I am totally team mashup – I love experimenting in the kitchen and it’s a great way to try different things and come up with something different and delicious – like this recipe! Hope you’re having a great weekend. Agreed! I’m a big fan of recipe mashups – really, why choose just one when you can have the best of both! 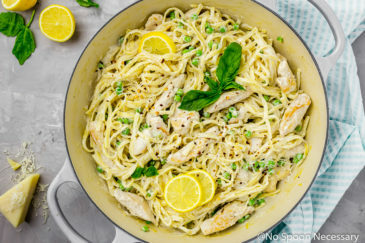 This pasta is truly drool worthy my friend! 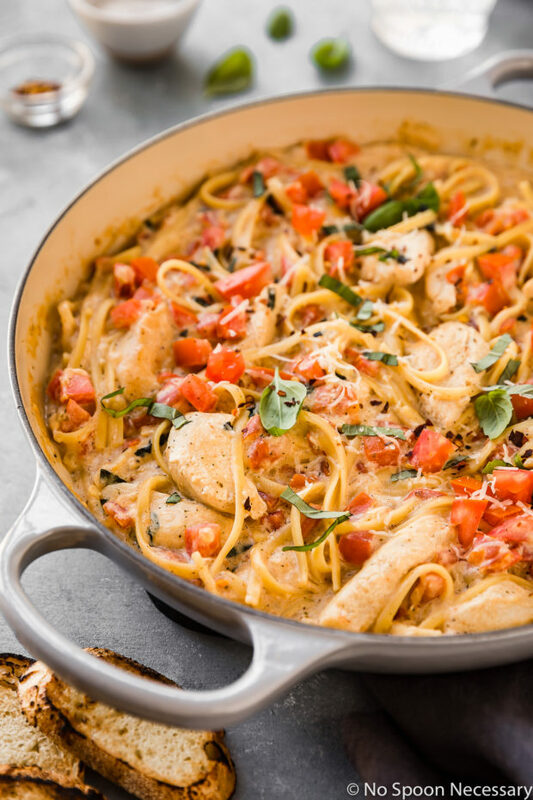 One pot meals are the best for all those busy weeknights! This one looks so good! I’m on Team Mashup! And this one looks amazing Chey! 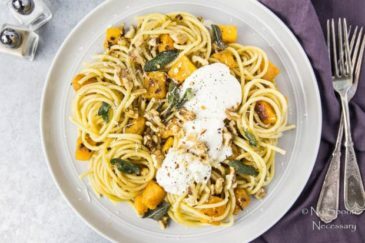 And who’s not up for a one pot wonder any night of the week?! Can’t wait to give this one a try! Happy weekend. Hope you’re staying cool! My thoughts on recipe mashups are quite positive! And this recipe proves my case! WoW! To have everything I love in one pot seems too good to be true! But it is true! Lucky us!! I’m fully onboard with mashups. Why choose between two dishes when you can have both? Some people are just kinda crazy :). This sound AWESOME! I love Margherita pizza so I know I’d love this. Happy weekend, Chey! I’m all about mashups. I think they’re so fun and creative! 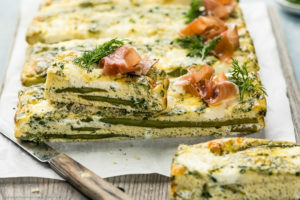 Like this recipe – I love it! It sounds incredible, especially with the ricotta cheese. Margherita pizza flavoured in pasta form sounds and looks beyond delicious. Carbs, fat and protein…all in one. I NEED this after weight training!